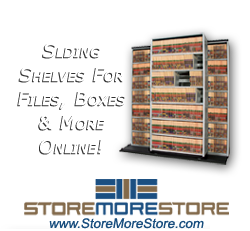 You can single or double stack boxes, then compact them in the future with the same shelving. 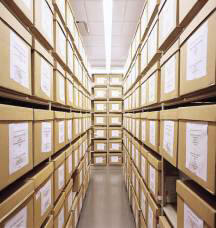 Specifically designed for archive box storage. 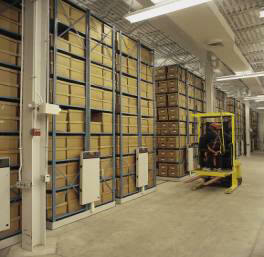 Standard non-moving shelving will hold boxes (upper right). In the future as your box storage requirements change you can lift the non-moving shelving up and put it on rolling bases (left and below). 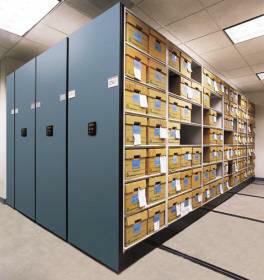 With the Spacesaver Universal Shelf the possibilities are endless. 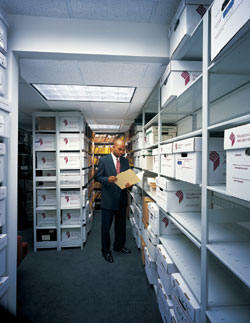 Phase 1 and Phase 2 approaches to your filing and archive box requirements save money for your organization. 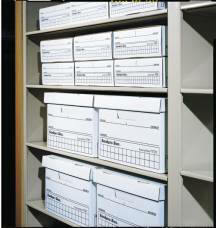 The Spacesaver Universal Shelf has a special finish to eliminate paint emissions, which helps protect your vital information / collection. Full design, delivery, and installation available.